World renowned Fairhope sculptor Bruce Larsen (left) reviews a sketch of a new sculpture of Auburn Heisman Trophy Winner Bo Jackson being added to the Academy’s Iron Bowl Monument. With him are Alabama Speaker of the House Mike Hubbard, R-Auburn (center) and State Rep. Randy Davis, R-Daphne (left). The Iron Bowl Monument at the United States Sports Academy is about to get its first addition—a running back depicting 1985 Auburn University Heisman Trophy winner Bo Jackson. 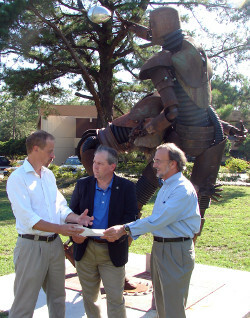 World renowned Fairhope sculptor Bruce Larsen, who created the monument to pay tribute to the University of Alabama and Auburn University football rivalry that began in 1893, unveiled sketches recently of the new sculpture to Alabama Speaker of the House Mike Hubbard (R-Auburn), State Rep. Randy Davis (R-Daphne) and Quentin Riggins, a football radio sideline reporter for Auburn’s ISP Sports Network. Larsen’s plans for the addition of Jackson impressed Hubbard, who led Jackson’s publicity campaign for the Heisman as an Auburn Athletic Department sports information director. The current sculpture, which was dedicated by Alabama football coach Nick Saban in May 2010, shows a quarterback releasing the ball right as he is getting tackled by a defender. Larsen, the Academy’s 2009 Sport Artist of the Year, said he’s looking for a Mack truck engine as a part of the sculpture. Larsen is known as a found object artist because he uses other people’s junk to create magnificent sculptures.  The unveiling of the new statue of Jackson will be a part of the Academy’s Awards of Sport ceremony and is scheduled for around 4 p.m. Friday, Nov. 11. In addition, the Academy’s Board of Trustees selected Jackson to receive the university’s Distinguished Service Award (DSA) in recognition of his many contributions and work with sick, troubled and disadvantaged children. In 1985, Bo Jackson and the Auburn president attended the Academy’s Awards of Sport in Mobile to receive the institution’s Amateur Sportsman of the Year Award. 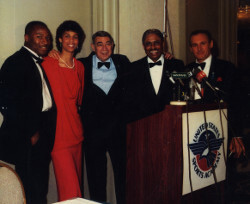 Pictured at the presentation (left to right) are Jackson, Cheryl Miller, Howard Cosell, Eddie Robinson and Dr. Thomas P. Rosandich. In 1985, Jackson and the Auburn University president came to Daphne to receive Jackson’s award as the Academy’s Amateur Sportsman of the Year. During that presentation, he also received a magnificent running back sculpture of himself by Oregon artist Ramon Parmenter. Davis said he looks forward to seeing Larsen’s sculpture of Jackson added to the Iron Bowl Monument. Someday, it is envisioned this monument will consist of 22 football players on both sides of the line. The American Sport Art Museum and Archives (ASAMA), a division of the United States Sports Academy, is acclaimed to be the largest sports art collection in the world. Founded in 1984, ASAMA is dedicated to the preservation of sports art, history and literature. The ASAMA collection is composed of more than 1,500 works of sport art across a variety of media, including paintings, sculptures, assemblages, prints and photographs. The museum is free and open to the public from 8 a.m. to 4 p.m. Monday through Friday.